A Centauro of the Royal Jordanian Army. The Spanish manufacturer Star Defense Logistics & Engineering (SDLE) will have an important role in the future of the Royal Jordanian Army after it won a contract for reactivating surplus Centauro wheeled recce vehicles/tank destroyers. The desert kingdom’s ground forces were reorganized earlier this year and longstanding armor units are being reassigned Centauros that were purchased from Italy. The Centauro is based on an 8×8 Freccia APC carrying a turret armed with a 105mm gun and is used for reconnaissance missions. Centauros are quite rare in the Middle East and Jordan’s acquisition of 141 was meant as a replacement for its older main battle tanks. In a press released shared by SDLE the company revealed it was sending “between 10 and 20” technicians to assist the Royal Jordanian Army’s adoption of 80 Centauros. The remaining vehicles are believed to be kept in storage for spare parts. SDLE refused to disclose the exact value of the “multi-million” Centauro contract but it acknowledged the project will have input from Iveco-Oto Melara, the original Italian manufacturer of the Centauro. SDLE also mentioned it was “committed to the Jordanian Army” in providing life cycle support for the vehicles. 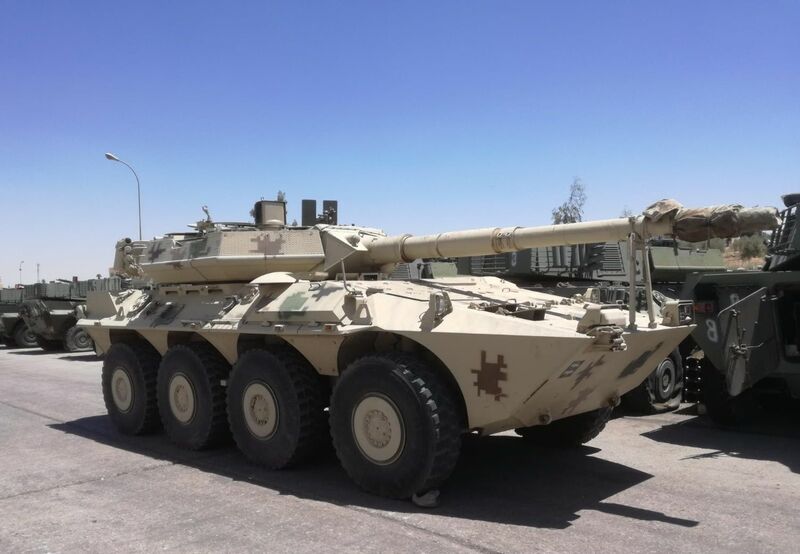 SDLE hasn’t commented on whether it’s pursuing other deals in the country for maintenance and spare parts needed by the army’s 103 Scimitar tracked recce vehicles; several hundred M113 APCs; its 300-odd YPR-765 and Marder IFVs; 358 M109 155mm self-propelled howitzers; and at least several hundred Humvees. From its main office in the outskirts of Madrid, SDLE specializes in repairs and upgrades for NATO armored vehicles and is the sole remaining manufacturer of the Dragoon multirole 4×4 in Western Europe. Despite having a smaller budget compared to its neighbors in the Gulf the Jordanian army are better equipped with British and US-made kit. On paper, the army does boast several hundred second and third-generation tanks (these include mothballed Centurions and Chieftains) but since last year the fleet is being depleted as the older Challenger 1 MBTs–hand-me-downs from the British Army–are retired for lack of maintenance. The disappearance of the Challengers leaves the army with 182 M60A3 Pattons upgraded to the Phoenix standard by the state-owned KADDB. The arrival of 80 Centauros should bolster the armored fleet in the 2020s. The kingdom’s military spending in 2017 totaled $1.63 billion with US military aid, or Foreign Military Assistance (FMA), pegged at just $350 million. These are paltry sums when the military spending of countries it shares borders with are assessed. Israel, for example, gave a $18.5 billion budget to the IDF in the same year and this was inflated by an additional $3.1 billion in US military aid. Iraq’s military spending was even higher in 2017 at $19.3 billion while Saudi Arabia has sunk an estimated $200 billion into its military since 2015. Of course, these glaring disparities can be explained by the fact Jordan has a smaller economy and doesn’t have steady fossil fuel exports to balloon its spending. It isn’t at war either and is relatively stable while the rest of its neighborhood is mired in conflict.